Enjoying a privileged position right opposite the Giralda, "Catedral Terrace" is a wonderful vacation rental town-house with a split-level terrace giving views of Seville's iconic tower. The house has four bedrooms and four bathrooms. Suitable for up to 8-9 guests. Refurbished to a superior standard while respectful of the original architecture, the house combines modern elements with traditional features of Sevillian craftsmanship such as carved wooden doors, wrought ironwork and ceramic tilework. The ground floor has a patio with a seating area and a tiled fountain. Just off the patio is a bedroom with a double bed, a built-in wardrobe and an en-suite bathroom. The well-equipped modern kitchen and living room are on the first floor. The living room is extremely spacious with plenty of seating and includes a dining table. A traditional Sevillian cierro window lets in plenty of light and looks out towards the Cathedral. There are two double bedrooms on the second floor, both with en-suite bathrooms. 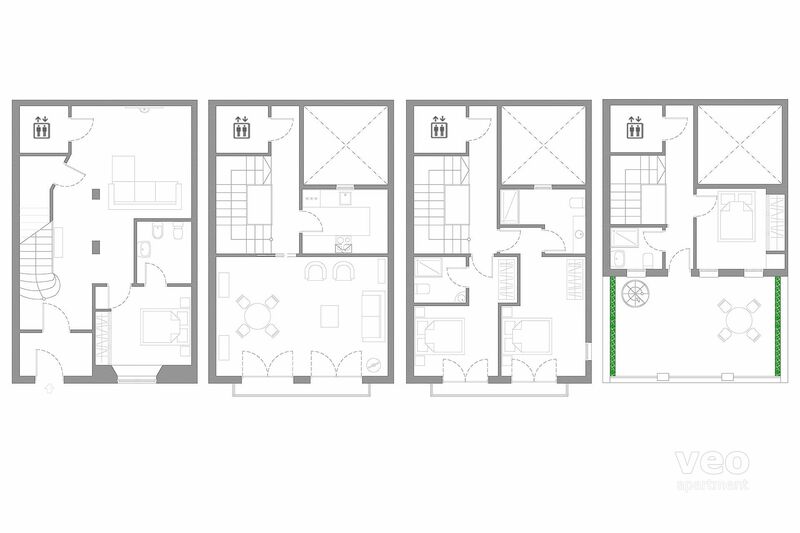 On the third floor is the fourth bedroom, also a double, and a separate bathroom. Access to the terraces is from the third floor. Wrought iron circular stairs lead from the lower to the upper two terraces. The lower and top terrace both have seating and a table - perfect for enjoying an unrivalled view of the Cathedral and Giralda tower. 2 nights. 3 nights weekends. There is a flat daily rate during Holy Week / Semana Santa (1500 EUR) and April Fair / Feria de Abril (800 EUR), independently of the number of guests. This rate includes all expenses, such as final cleaning. Reservation by email required. 15:00 - 23:00h. Early/late check-in is possible but subject to availability. Late check-ins after 23:00h have an additional charge of 30 EUR. Daily rate: 15 EUR. Reduced price at car park "El Arenal". Located at 600 m from the apartment. Reservation by email required. Baby cot: 10 EUR per night. Please request on your booking form.